“From all over the Netherlands and Belgium about 75 friends of the Triratna Buddhist Community came on Sunday June 19th to celebrate the ‘Laying of the First Brick’ of our brand new Retreat Centre. Three friends from the Paris Triratna Centre joined us, as well as several locals from the tiny Hengstdijk village just along the road. Coffee, tea and cake were served in the village hall. Then we walked the ten minutes to the building site which was covered with a sea of camomile and poppy flowers, swept by the vivid south-western wind which is ever-present in the area. 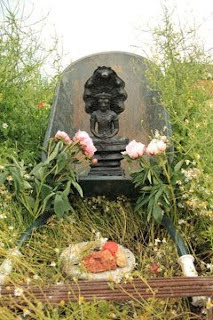 "On the site five shrines were improvised from building materials, sticks and various odds and ends, representing the Mandala of the Five Buddhas, with the Buddha Shakyamuni in the centre. We dedicated the site to the practice of tranquillity, generosity, meditation, compassion, wisdom and fearlessness, for the happiness and welfare of all beings. "The next day, Monday June 20th, the building work actually started. 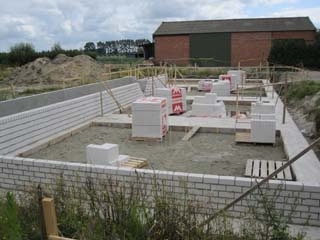 As you will see from the photograph, already the outline of the building has become apparent!